New York, May 1, 2006. Baruch College’s executive Masters of Science in Industrial and Labor Relations (MSILR) program’s academic director, Professor Richard Kopelman, and the Jan Stackhouse award and scholarship committee will announce the first winners of the Jan Stackhouse Award to a graduating student, Ms. Janet Rivera, and the Jan Stackhouse Scholarship to a continuing student, Mr. Daniel Kearney, today at 6 pm at the Vertical Campus, rm. 14-250. Jan Stackhouse, the former membership services director of SEIU 1199, a Brooklyn resident and longtime activist in the labor and women’s movements, was murdered in Stockbridge, MA one year ago. The murder remains unsolved. In honor of Ms. Stackhouse, her family, friends and colleagues at SEIU 1199 raised over $60,000 to endow an annual award to a graduating student and a scholarship to a continuing Baruch student in the MSILR program. “This first year’s winners represent the kind of dedicated, people-oriented activist that Jan was,” says Professor Kopelman. Janet Rivera, the Jan Stackhouse Award winner, helped to organize the first Women’s Labor-Management Committee in New York City Transit in collaboration with female executives of the Transit Workers Union and District Council 37. The committee’s goal is to empower women through education, training and mentoring programs. Ms. Rivera is currently a labor relations manager at Cabrini Medical Center. Daniel Kearney, the Jan Stackhouse Scholarship winner, is a senior labor relations representative at the Mt. Sinai Hospital/School of Medicine. Mr. Kearney has been involved with a number of labor organizations, including the Teamsters Local 804, Local 32BJ SEIU, and District 1115. He has also worked with SEIU 1199 to offset layoffs at Mt. Sinai Hospital/School of Medicine. Donations to the Jan Stackhouse Fund can still be sent to Baruch College, Zicklin School of Business, One Bernard Baruch Way, Box B9-240, New York, NY 10010. Checks should be made out to Baruch College Fund/Jan Stackhouse Award & Scholarship. All donations are 100% tax deductible. The Baruch College Fund is a registered 501(c)3 organization. Additional fundraising events will be announced at www.janstackhouse.org. Baruch College, a senior college in the City University of New York, enrolls 15,000 students, including 2,500 graduate students, in three schools; the School of Public Affairs, the Weissman School of Arts and Sciences and the Zicklin School of Business, a top-50 undergraduate business school (U.S. News and World Report) and the largest accredited business school in the nation. Baruch College has joined with the family and friends of Jan Stackhouse to create a scholarship in the memory of the 1199SEIU labor activist who was murdered in Stockbridge, MA in May. The Jan Stackhouse Scholarship, the first scholarship named for a woman at Baruch College’s Zicklin School of Business, will provide educational funding for graduate students excelling in the field of industrial and labor relations. 1199SEIU, where Ms. Stackhouse worked as Director of Membership from 2002 until her untimely death, has agreed to be the “anchor” donor for the scholarship. 1199SEIU has also offered a $10,000 reward for information leading to the capture and conviction of Ms. Stackhouse’s killer. The parties have a goal of $50,000 to create an endowed scholarship which would be awarded beginning in fall 2006. Ms. Stackhouse was a lifelong labor activist and champion of workers’ and women’s rights. She also had a long history of supporting entrepreneurs and employee stock ownership companies, the latter during her time with the New York State Department of Economic Development. 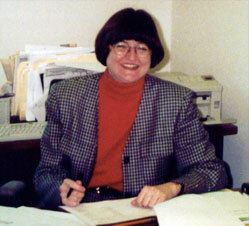 Upon returning to the labor movement after a period in consulting, Jan became one of a small number of staff in the labor world with an MBA and significant experience in the private sector. The goal of the Jan Stackhouse Scholarship is to support students who, like Jan, will use their managerial skills to advance the rights of workers. The scholarship continues Jan’s interest in worker advocacy and social economics, labor leadership and economic development. The scholarship would be granted to a graduate student in the Executive Master of Science program in Industrial and Labor Relations. More information will be available at www.zicklin.baruch.cuny.edu this fall. Donations for the Jan Stackhouse scholarship fund can be sent to Baruch College, Zicklin School of Business, c/o B. Wong, One Bernard Baruch Way, Box B9-240, New York, NY 10010. Checks should be made to Baruch College Fund/Jan Stackhouse Scholarship. All donations are 100% tax deductible. The Baruch College Fund is a registered 501 (c ) 3 non-profit. A memorial tribute for Ms. Stackhouse will be held at the Center for Worker Education, 99 Hudson Street, NYC, 7th floor, on July 15 from 6-9 pm. The Center has generously donated use of its space. The documentary - “Brass Valley,” which was co- produced by Ms. Stackhouse in 1980-83 under a grant from the National Endowment for the Humanities, about the brass workers in Connecticut, will by shown at 7pm that evening. Interested parties can RSVP to July15@janstackhouse.org. A second memorial tribute will be held at 1199SEIU on September 7, 2005 at 6 PM in the auditorium. The documentary, “Brass Valley,” will also be shown then. Interested parties can RSVP to sept@janstackhouse.org. 1199SEIU is located at 310 West 43rd Street in NYC. Additional memorial and/or fundraising events are being planned. Please visit www.janstackhouse.org for more information. Baruch College, a senior college in The City University of New York, enrolls 15,000 students, including 2,500 graduate students, in three schools: the School of Public Affairs, ranked 52nd in the nation for its Master of Public Administration program (U.S.News and World Report): the Weissman School of Arts & Sciences, an intimate liberal arts school with all the resources of a major university and the Zicklin School of Business, a top 50 undergraduate business school (U.S. News) and the largest accredited business school in the nation. For six consecutive years, Baruch College has been named by US News and World Report as the most diverse college in the United States.